Artists in the Black (AITB) is a specialised service for Aboriginal and Torres Strait Islander artists, communities and arts organisations. It is operated by the Arts Law Centre of Australia (Arts Law), the national community legal centre for the arts. The AITB service aims to provide access to free or low cost, culturally appropriate, specialist legal resources to support and strengthen the Indigenous arts sector. We do this in order for Indigenous creators to achieve professional excellence, a sustainable income in a non-exploitative environment and to achieve better recognition of Indigenous intellectual property. The name “Artists in the Black” is a play on the expression to be “in the black”, meaning to be financially profitable and not in debt, rather than being “in the red”. This name encapsulates the nature of this service, which helps Aboriginal and Torres Strait Islander artists to be “in the black” through access to legal advice, information and education about their rights so that they may gain financially from their artworks. Increase access by Indigenous artists, art organisations and Indigenous communities to legal advice on arts law issues, including Indigenous Cultural and Intellectual Property (ICIP). Increase access to legal information about arts law issues and develop appropriate publications. Increase understanding and awareness of Indigenous artists and communities of arts law issues through an education programme. Provide informed advocacy work on ICIP issues and other arts law issues affecting the Indigenous community. 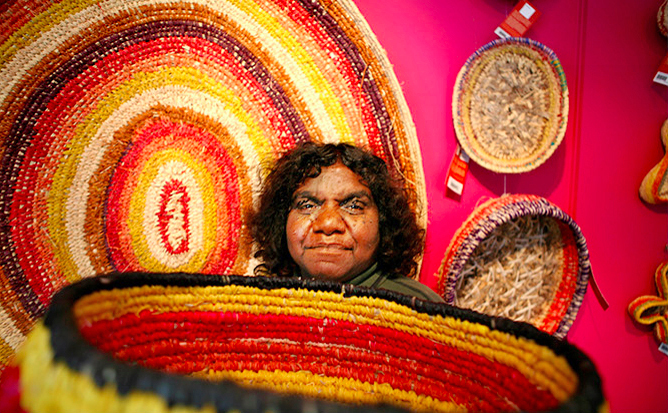 Develop arts-specific law expertise within the Indigenous community. The other key focus area for AITB is responding to the needs of the Aboriginal and Torres Strait Islander artists on the better protection of, and respect for, Indigenous Cultural and Intellectual Property (ICIP). The misuse and misappropriation of ICIP causes significant distress and harm to Aboriginal and Torres Strait Islander peoples and their cultures and we continue to look at legal and advocacy strategies to provide protection and remedies in this regard. In 2016 we launched our Innovate Reconciliation Action Plan, 2016-2018. An Innovate RAP is for organisations like ours that have developed strong relationships with their Aboriginal and Torres Strait Islander stakeholders and are ready to develop or implement programs for cultural learning, Aboriginal and Torres Strait Islander employment and supplier diversity. The Innovate RAP will give the Arts Law Centre of Australia the freedom to develop and test new and innovative approaches, and embed our Innovate RAP into our organisation. Since the commencement of our Artists in the Black program, we have engaged Indigenous staff to assist our Indigenous clients and manage the AITB Program. To speak with our AITB Coordinator please call (02) 9356 2566 or 1800 221 457 or email aitb@artslaw.com.au. Arts Law has been providing legal services to the arts community since 1983. However, when we looked at the rip-offs and exploitation of Indigenous artists still occurring, the case for a specialised service for Indigenous artists was overwhelming. AITB was established in 2004 and has been building upon the initial seed funding we received from the Australia Council so that our work with Aboriginal and Torres Strait Islander arts communities now accounts for over 35% of Arts Law’s work. This is indicative of the high level of need in these communities but it also reflects the growth and diversity in the Indigenous arts sector and the increasing complexity of the type of advice and support we are asked to provide. The Arts Law Centre of Australia conducts all its programs and services with the knowledge, sensitivity and understanding of cultural protocols to the best of our ability. The Arts Law Centre of Australia endeavours to consult with communities and staff associated with our programs and services so that we are aware of the particular Sorry Business protocols that may arise. We are aware that in some Aboriginal and Torres Strait Islander communities it is offensive to mourning practices to reproduce the names or images of deceased people. Sometimes these restrictions may last many years. The Arts Law Centre of Australia will not use a deceased person’s name or image unless the centre has obtained permission either from the individual at the time of meeting the individual or subsequently from relevant family members or elders. If the Arts Law Centre of Australia becomes aware of an individual’s death and is not able to obtain permission to use their materials, we will not publish any new images and will take reasonable steps to remove any images from the website. No materials will be used without a consent form that specifically provides consent in the case of death. This may involve seeking permission from relatives, community or Elders. Permission to use a deceased person’s name and image will be delivered in writing and outline whether the permission is ongoing, restricted to a particular person/company or for viewing in a particular area. Written permission will outline these particulars and clarify whether the individual wishes to use a mourning name. Please contact the Arts Law Centre of Australia immediately if you do not see these protocols embodied throughout our website and/or publications. Written in alignment with the Australian Human Rights Commission Aboriginal and Torres Strait Islander Peoples Engagement Toolkit 2012.